BRIDGEVIEW, Ill., Nov. 08, 2018 (GLOBE NEWSWIRE) -- Manitex International, Inc. (NASDAQ:MNTX), a leading international provider of cranes and specialized industrial equipment, today announced the unveiling of a Manitex 22101S boom truck with custom graphics to help support the fight against cancer. 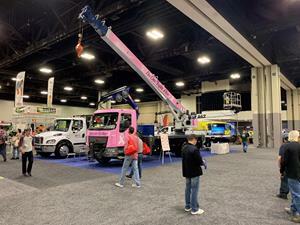 October was breast cancer awareness month and Manitex, along with several dealers, have customized a Manitex boom truck for the 2019 TCI Expo in Charlotte, NC showing their support. This crane will be displayed proudly for the duration of the event and will go into service with its colors immediately after the show. Manitex will donate the excess contributions from our dealers and customers to the local Charlotte chapter of the Susan G. Komen foundation for furthering breast cancer research. Steve Kiefer, President and Chief Operating Officer, commented, "Continuing to build awareness and commitment to identifying the risks and symptoms, developing more effective treatments, and ultimately cures of this killing disease, our dealers and partners relish the opportunity to work together and join the fight to find a cure." Manitex International, Inc. Darrow Associates, Inc.